A brain injury model was induced by needle insertion on the head of an adult zebrafish. 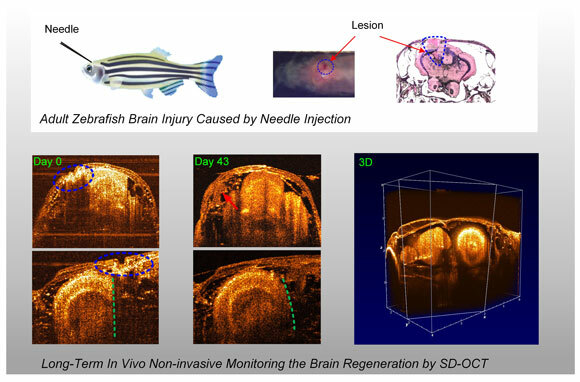 Long-term in vivo noninvasive monitoring and 3D imaging of the brain regeneration process of the adult zebrafish were successfully achieved using spectral-domain optical coherence tomography (SD-OCT). The zebrafish, as a model of vertebrate biology, is widely recognized as an excellent system for exploring brain regeneration. To date, few neuroimaging modalities have been able to effectively and noninvasively visualize the structural and functional information of the adult zebrafish brain after injury in real time with high spatial resolution and good penetration depth. For the first time, to the best of their knowledge, Professor Zhen Yuan's group at the Faculty of Health Science, University of Macau employed a spectral-domain optical coherence tomography (SD-OCT) system for long-term in vivo monitoring of tissue regeneration in three dimensions using a model of an adult zebrafish with brain injury. This pilot work, together with the pronounced regenerative capacity of the adult zebrafish, provides us with an insight into the process of brain regeneration. This report was published in Chinese Optics Letters Volume 14, No.8, 2016 (J. Zhang et al., Long-term in vivo monitoring of injury induced brain regeneration of the adult zebrafish by using spectral domain optical coherence tomography). Compared with the current imaging techniques, SD-OCT is able to effectively and noninvasively monitor brain regeneration at different stages in a mechanically damaged brain of adult zebrafish in real time. Based on the generated images of the brain, SD-OCT enables the characterization and evaluation for describing the process of brain regeneration with high, three-dimensional spatial resolution (12 μm axial and 13 μm lateral) at video rate. This unprecedented technique using SD-OCT will prove to be a useful tool for studying the zebrafish brain, particularly in biological procedures in vivo and dynamic processes. "The present work will definitely play an essential role in the investigation of the brain structure and function using an adult zebrafish as the model," said Prof. Wei Ge, the associate dean of Faculty of Health Sciences, University of Macau. Further work will be focused on performing angiography and molecular imaging on zebrafish head using SD-OCT, and applying these techniques to different biomedical problems.